Kids who grew up watching Jurassic Park were all but guaranteed to both love and fear the Tyrannosaurus rex. The film portrays this hulking king of dinosaurs as both a ferocious and noble creature that, unlike the sly velociraptors that sneak up on their prey, will straight up run you down and stomp you into the mud. But it turns out that a real-life T. rex on the hunt, like most cool things in movies, was likely more boring and much, much slower. 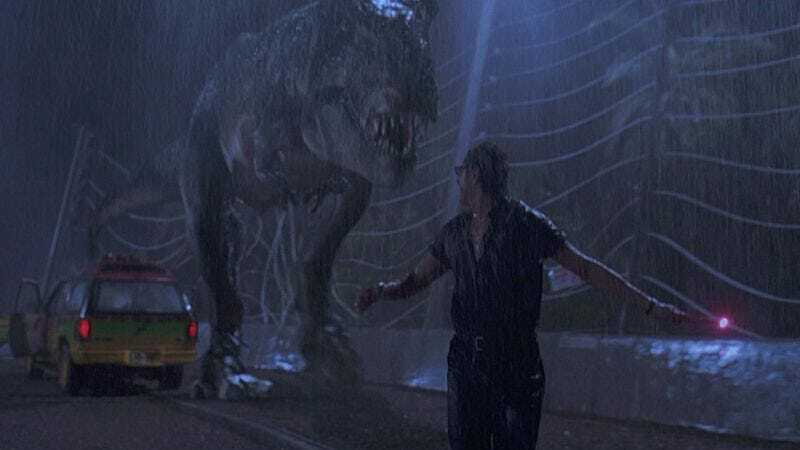 Two recent studies from Nature Ecology & Evolution and PeerJ used computer simulations and skeletal stress analysis to determine that the T. rex was only capable of reaching top speeds of 12 to 17 miles per hour, far below the 32 miles per hour the character John Hammond boasts in the 1993 film. Furthermore, the PeerJ study concluded that, since a T. rex could weigh as much as 9 tons, it wouldn’t even be able to get up to running speed without risk of breaking the bones in its legs, not to mention really embarrassing itself in front of Jeff Goldblum. The carnivorous behemoth more likely used its size and powerful jaws to take down slower-moving herbivores or scare off competition when scavenging. It can be disheartening to realize that the speedy, terrifying dinosaur from your childhood was more likely a big-assed, speed-walking vulture. But, as leader of the PeerJ study professor William Sellers told Motherboard this week, “T. rex hatch out of eggs the size of footballs, and then grow over the space of 20 or so years. An adolescent T. rex would be just the right size to think that a human was definitely worth the effort and would be small enough that it probably could run reasonably fast.” So, keep your eyes peeled for teeny-bopper T. rexes in Jurassic World 2.